Diario Libre is reporting that members of human rights groups for the disabled marched in Port-Au-Prince protesting after three deaf-mute women were lynched by mobs in a religious-frenzy over the past fortnight. According to Diario Libre, the three women's bodies were found in a drainage ditch, burned and mutilated. The newspaper reported that the three women were on their way to work, and that this act could frighten members of the community from leaving their homes and engaging in fruitful labor. Haiti is currently facing one of the most turbulent periods in its history, with a cholera outbreak preventing the country from fully rebuilding since an earthquake destroyed what little infrastructure the island had. The humanitarian crisis is compounded by a drought which has increased hunger over the past 6 months to near-famine levels, straining United Nations peacekeeping forces, who have been in the country since a US-backed coup removed the democratically-elected government of Jean-Bertrand Aristide, who was forcefully led by US Marines into exile in Africa. In the decade since Mr. Aristide's removal, instability and desperation have reigned in the poorest nation in the Western Hemisphere. In the midst of this chaos, the Tonton Macoutes, a religious paramilitary army loyal to the cult of former Dictators Papa and Baby Doc Duvalier, have made a resurgence. 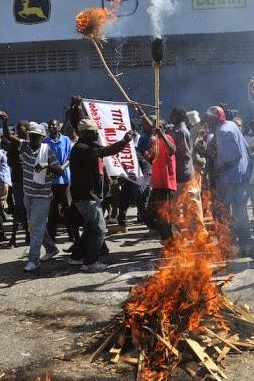 In times of crisis and desperation, when there is no end in sight, people often turn to religious extremism, as is now evident again in Haiti. In the same way that albinos in some parts of Africa are targeted for their body parts to be used in rituals, so may the international community need to further intervene in Haiti, perhaps providing asylum to the disabled who manage to escape persecution.